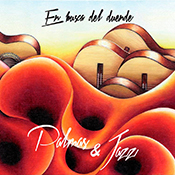 Palmas & Jazz is a duet that was born from the encounter and friendship between a jazz guitarist (Carles GR) and a flamenco guitarist (Pablo Gibaux). "En busca del duende,” fusion of flamenco and jazz, this is their first record together. With the exception of their interpretation of jazz standard, "A Night in Tunisia", all the other titles are original compositions.